Supplemental Figure S1. 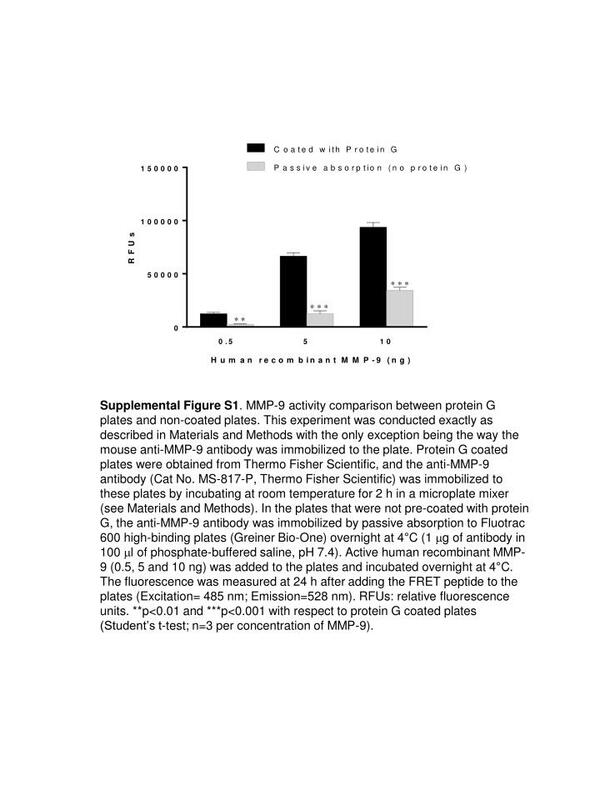 MMP-9 activity comparison between protein G plates and non-coated plates. 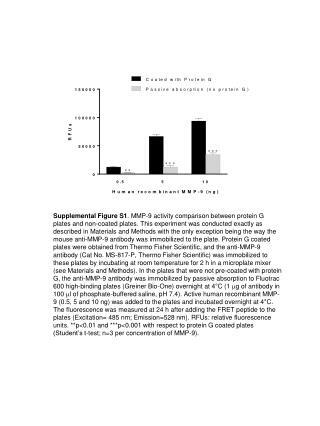 This experiment was conducted exactly as described in Materials and Methods with the only exception being the way the mouse anti-MMP-9 antibody was immobilized to the plate. 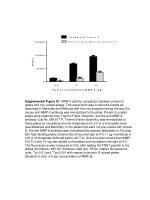 Protein G coated plates were obtained from Thermo Fisher Scientific, and the anti-MMP-9 antibody (Cat No. MS-817-P, Thermo Fisher Scientific)was immobilized to these plates by incubating at room temperature for 2 h in a microplate mixer(see Materials and Methods). In the plates that were not pre-coated with protein G, the anti-MMP-9 antibody was immobilized by passive absorption to Fluotrac 600 high-binding plates (Greiner Bio-One) overnight at 4°C (1 mg of antibody in 100 ml of phosphate-buffered saline, pH 7.4). Active human recombinant MMP-9 (0.5, 5 and 10 ng) was added to the plates and incubated overnight at 4°C. The fluorescence was measured at 24 h after adding the FRET peptide to the plates (Excitation= 485 nm; Emission=528 nm). RFUs: relative fluorescence units. **p<0.01 and ***p<0.001 with respect to protein G coated plates (Student’s t-test; n=3 per concentration of MMP-9).